Most of the amateurs I coach do a pretty solid job of controlling the speed and distance they roll putts, and are better than they think at starting the ball on their desired line. Unfortunately, this line isn’t close to what’s needed to ensure a make — green reading continues to be the recreational player’s bugbear putting skill, particularly on longer putts. Help is on the way, courtesy of my Three Zone Read system. When facing any putt over 20 feet, divide the span from the ball to the hole into thirds. Focus 10 percent of your read into the first third of the putt. 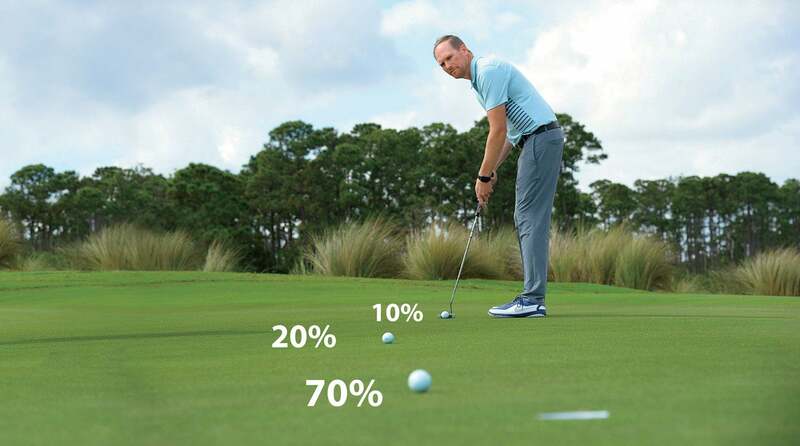 The second third gets 20 percent of your attention, while the third section of your putt, closest to the hole, makes up 70 percent of the read. As your ball gets nearer to the hole, it slows down. As it slows down, it's more susceptible to the subtle breaks around the cup. Study these the most. Base your read more on what the break looks like near the hole. It helps to read putts from the cup back to your lie. Even as you make your stroke, keep your focus on the final third of the ball's roll.